Index stocks drag markets. The benchmarking indices fell on Monday as the investors ventured profit booking in banking and oil stocks, however, buying interest in auto and metal shares brought down the losses. Mumbai: The benchmarking indices fell on Monday as the investors ventured profit booking in banking and oil stocks, however, buying interest in auto and metal shares brought down the losses. The markets opened on a positive note following the surprise rate cut decision by the China central bank on late Friday but failed to sustain the trend. 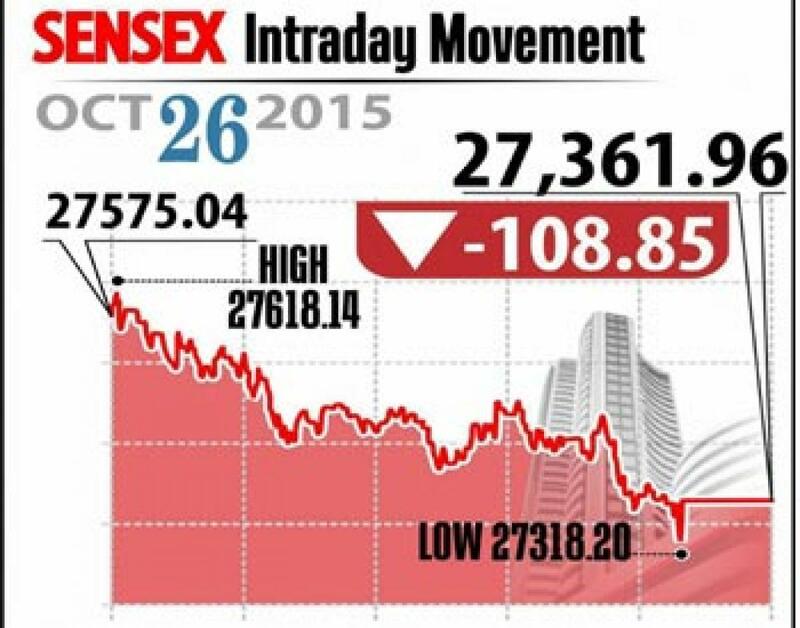 Sensex fell 108.85 points to 27,361 and Nifty down 34.90 points to 8,260. The broader markets also reflected the trend with midcap and smallcap down 0.5 to 0.7 per cent each. Experts say that the volatility is expected to continue in the coming days till expiry of October F&O contracts, which are due on Thursday. Also they say that the earnings announced till now are seen mixed, hence there is no possibility for the market to gain. Coming to sectoral front, the power index gained top along with capital goods, auto and IT indices, while others bankex, oil & gas, metal and realty indices reported losses. From capital goods space, BHEL up 3.7 per cent and L&T closed flat ahead of quarter earnings later this week. While auto stock firmed up looking at the forthcoming earnings with Maruti, Bajaj Auto, Tata Motors and Hero MotoCorp closed with gaining up to 2.1 per cent. From metals pack, Vedanta and Hindalco up between 0.3 and 2.4 per cent each as the government is expected to double import duty on aluminium, also Tata Steel gained 1.4 per cent. The gainers: BHEL, up 3.72 per cent at Rs 217.55; Vedanta, up 2.40 per cent at Rs 104.70; Bajaj-Auto, up 2.14 per cent at Rs 2,567.55 and Tata Steel, up 1.38 per cent at Rs 249.45. The losers: Coal India, down 2.40 per cent at Rs 333.20; HDFC, down 2.09 per cent at Rs 1,312.85; Bharti Airtel, down 1.91 per cent at Rs 351.90 and Reliance Industries, down 1.34 per cent at Rs 943.